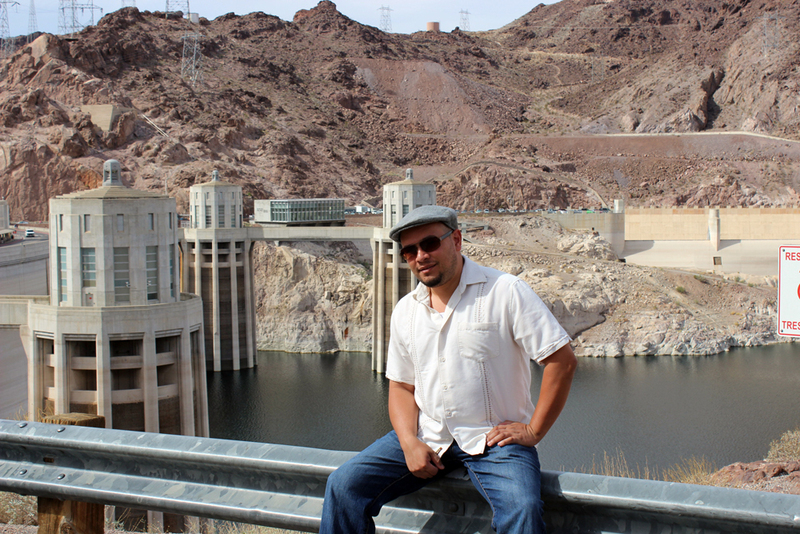 It was day 3 of my trip to Vegas and another day full of countless adventures with my best friend Santiago. 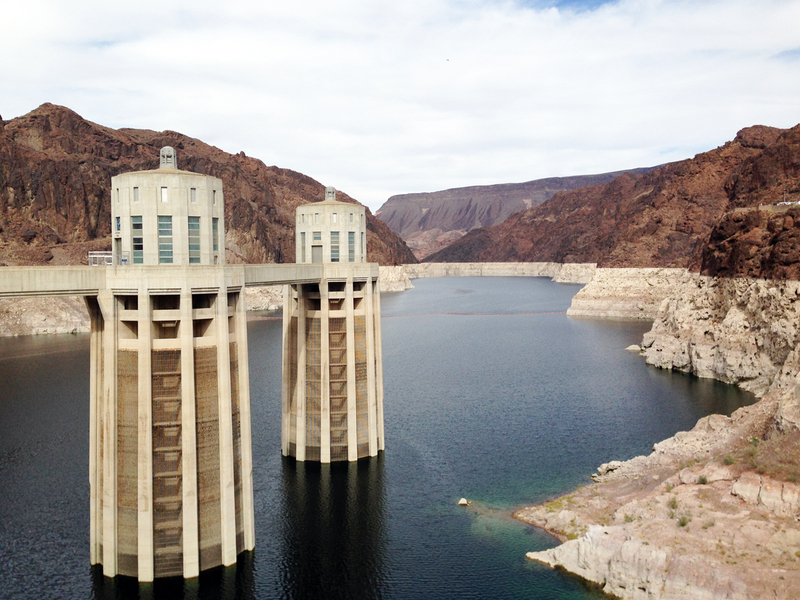 On this day we visited the incredible Hoover Dam, the adorable Boulder City, the breathtaking Lake Mead, and ended the day with a nice delicious dinner with friends. 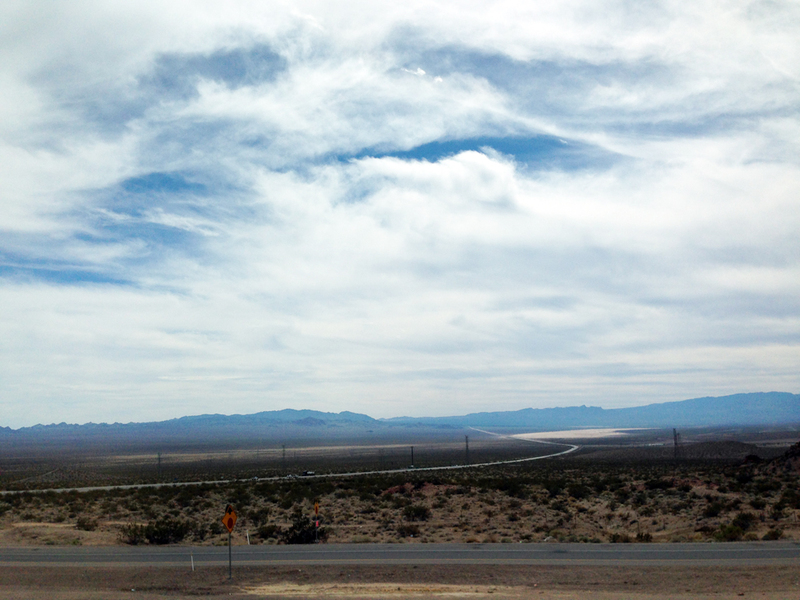 On our drive to the Hoover Dam I just sat back and gazed at the scenery of endless mountains that looked like paintings. 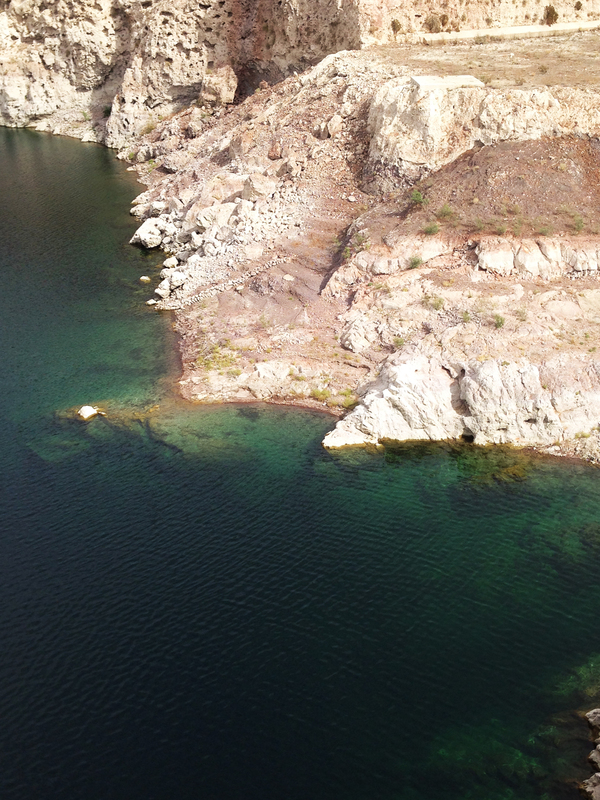 Nevada really is such a beautiful place engulfed in nature. 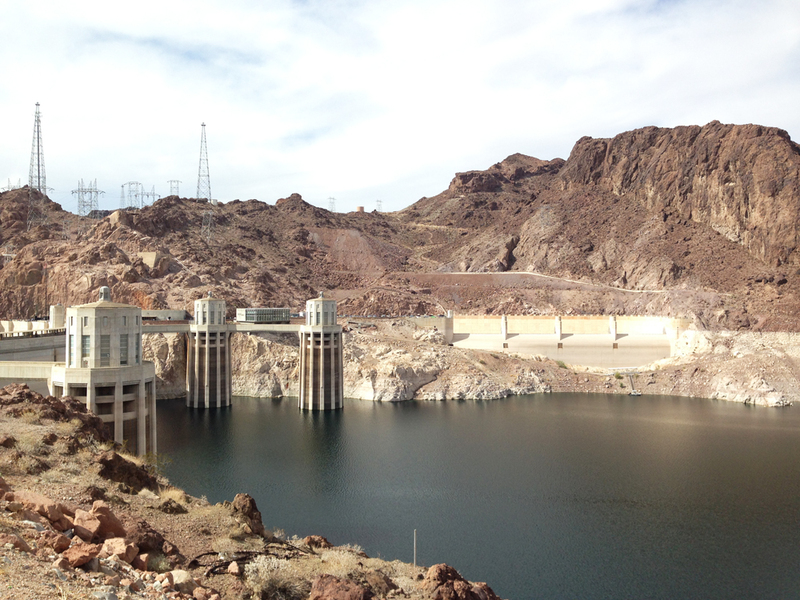 Our first stop was initially Lake Mead but thanks to the government shutdown, we weren’t able to get too close to the lake. 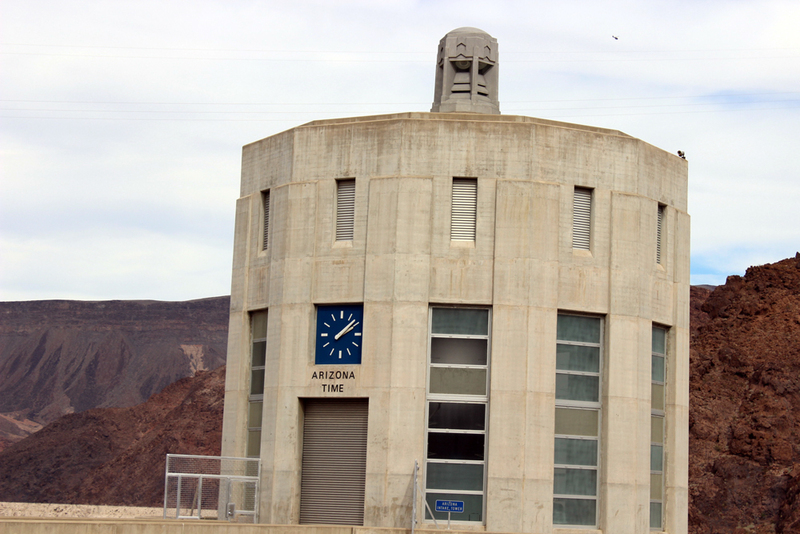 We were also afraid it might affect our trip to the Hoover Dam but luckily it was still in business. 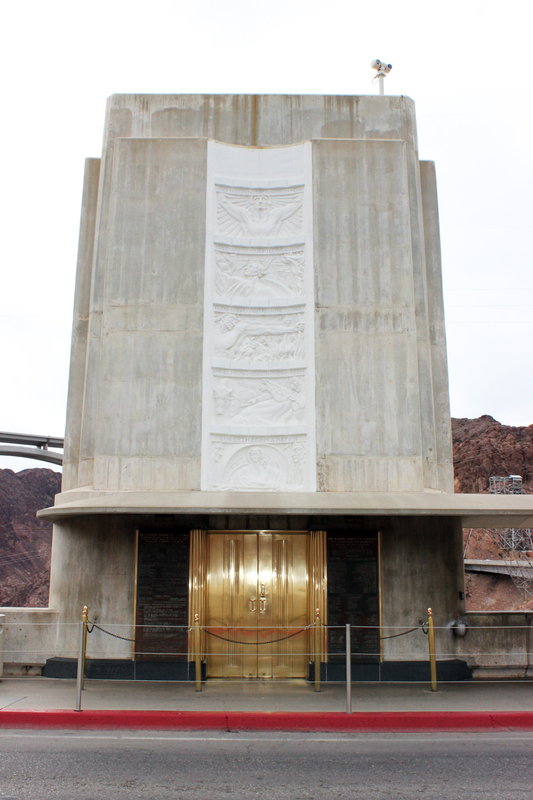 This was my first time to the Hoover Dam and I was very excited to visit and when I arrived, this 1930’s art deco masterpiece took my breath away. It was so enchanting, it didn’t even seem real. 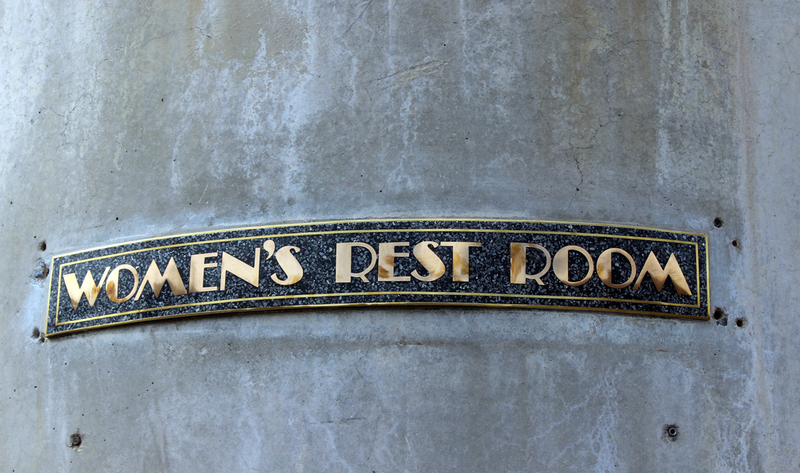 Santiago and I are such nerds and so easily pleased that we were geeking over the deco gold angels that were now an emerald-green due to oxidation, the typography of the bathroom signage, and even the terrazzo floors! For a touristy place it sure was relaxing and I was so thankful that my bestie took me there. After that we headed over to an adorable town called Boulder City where the houses looked like gingerbread and I wanted to eat them all. The entire city was adorned with flowers and the cutest houses I have ever seen! Wondering around we found ourselves at a fun antique shop called Goat Feathers Emporium. I have been to a few antique shops similar to this one, engulfed in antiques and vintage things, so much that you immediately get A.D.D as soon as you walk in. I didn’t know where to begin as I loved everything but I kept myself on a leash and left with just an awesome vintage spanish earrings and brooch set and a bag full of candy :). After that we were off to another antique shop just around the corner called Back in Thyme where we met Hundred-Dollar-Bill, a really nice gentleman who works at the shop and had many great stories to tell. I love meeting people like that, those who have lived such interesting and inspiring lives. The shop had the best collection of vintage petal cars I had ever seen and had hundreds of authentic antique Tiffany utensils. I found a vintage Barbie hat box/purse that I have been lusting over for ages on one of his shelves and just had to have it. It was so meant to be because I had come across a few in my time but none in such pristine condition and at a great reasonable price. I was smitten over the damn thing! And just when I thought it couldn’t get better…Mr. Hundred-Dollar-Bill was so sweet and gifted me 3 photos of The Three Stooges, one featuring Lucille Ball in the beginning of her career as an actress. I thought my day couldn’t get any better but it did when we met up with our friends Daniel, Riannon, and their adorable daughter Mila for a nice seafood dinner. 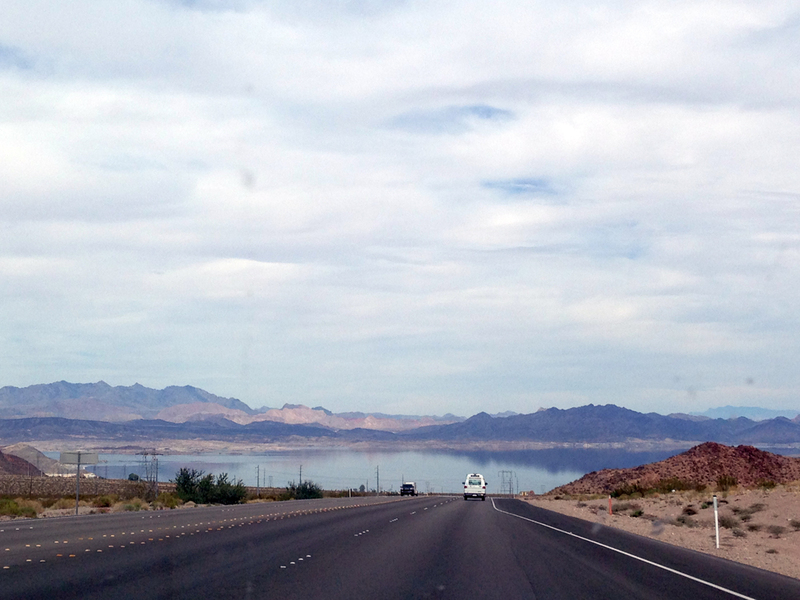 On the drive toward the Hoover Dam you can see Lake Mead and the reflection of the sky. 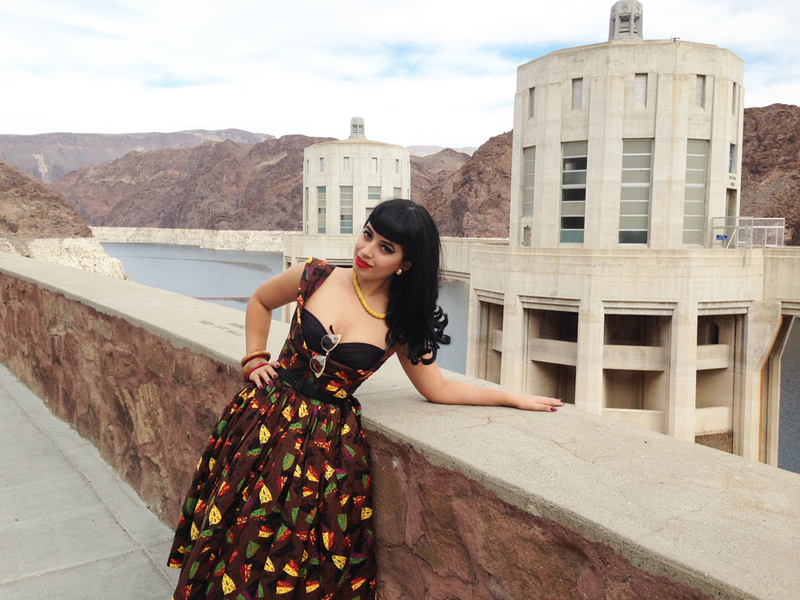 Hoover Dam! Unreal. My bestie Santiago! Can I live here? I wanted to take a swim. Crazy I know but isn’t it pretty? 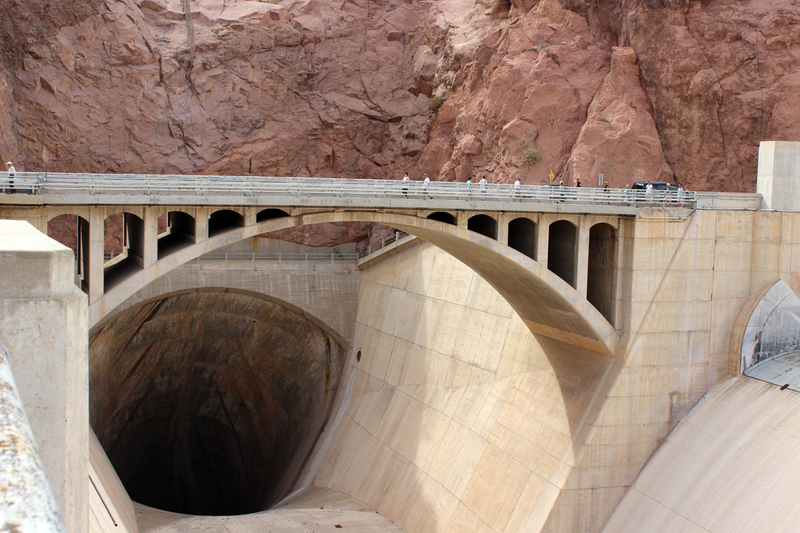 I am guessing this giant inner tunnel is for an emergencies just incase there is a flood and the water rises. Kinda scary if you ask me. I loved it. Now I can say I have visited Arizona! haha. 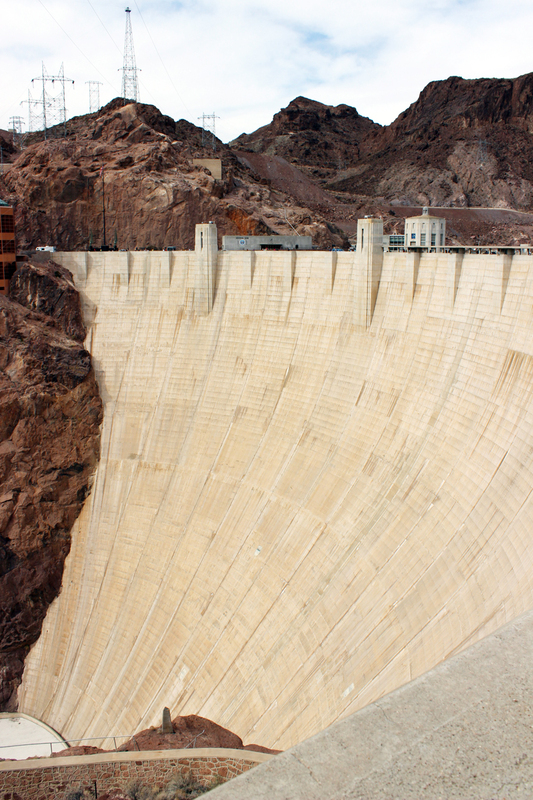 This giant wall keeps the water at bay and generates enough electricity to light up all of Vegas! Gorgeous. Completely art deco. 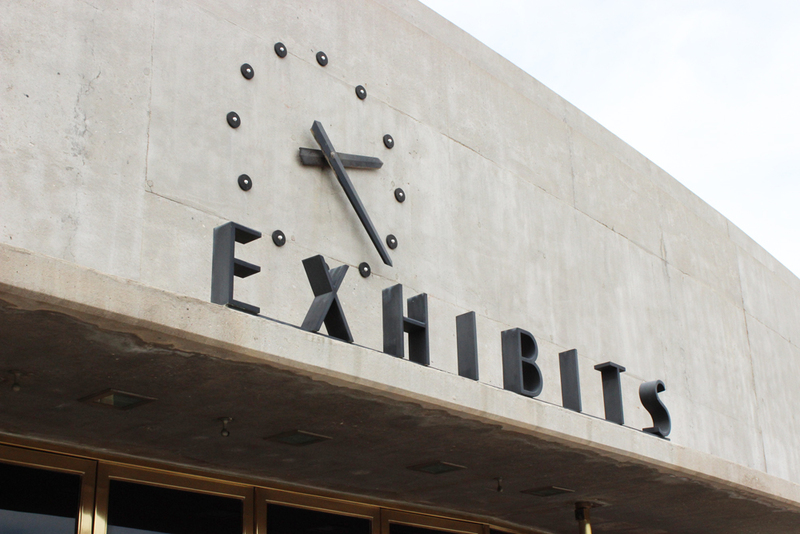 Even the typography of the signs! Astrological. The signs. 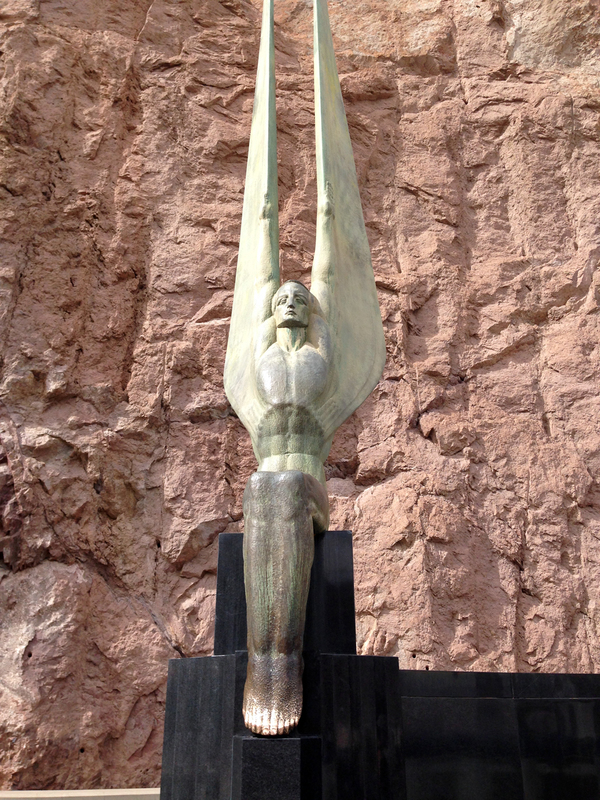 One of the beautiful oxidized angels. I is so small. 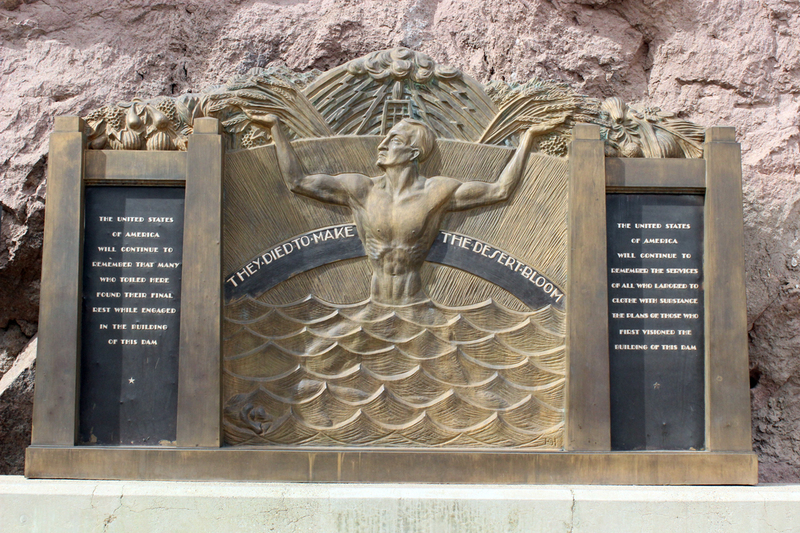 “They died to make the desert bloom”. 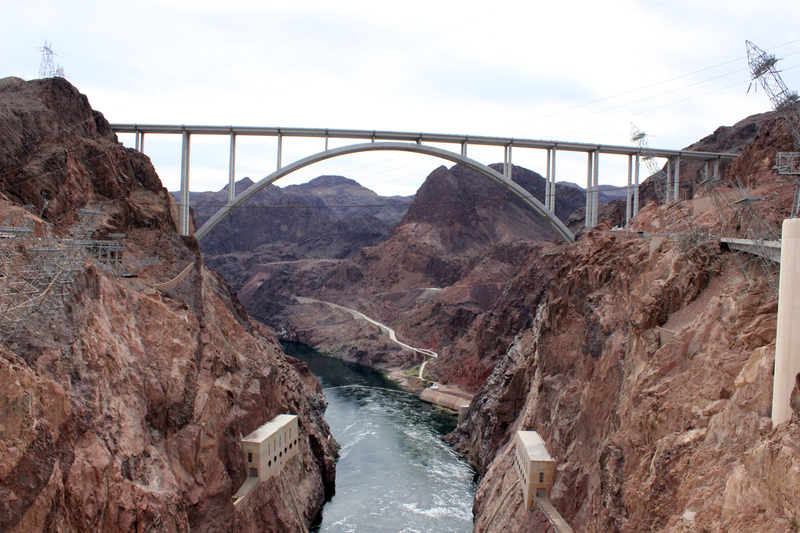 Many of the men who built this dam died while helping to build it. 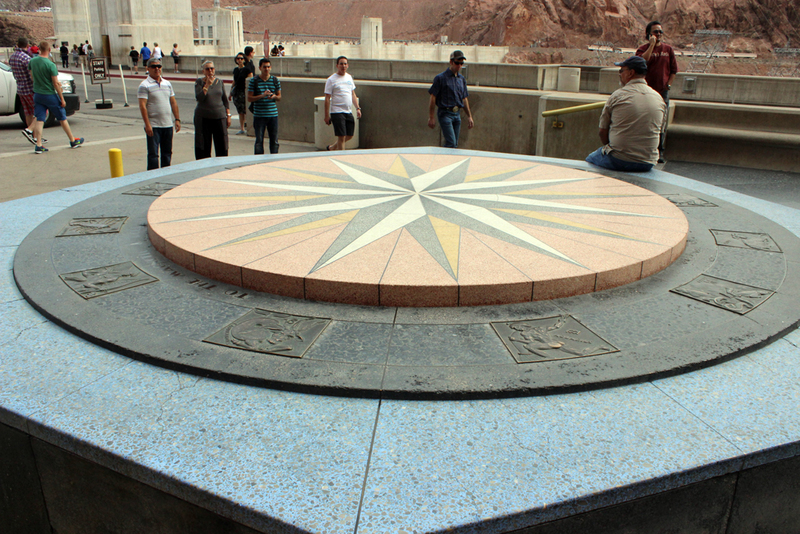 Nevada pays homage to them for being brave and creating something so monumental. I wanted to steal this sign off of the wall! 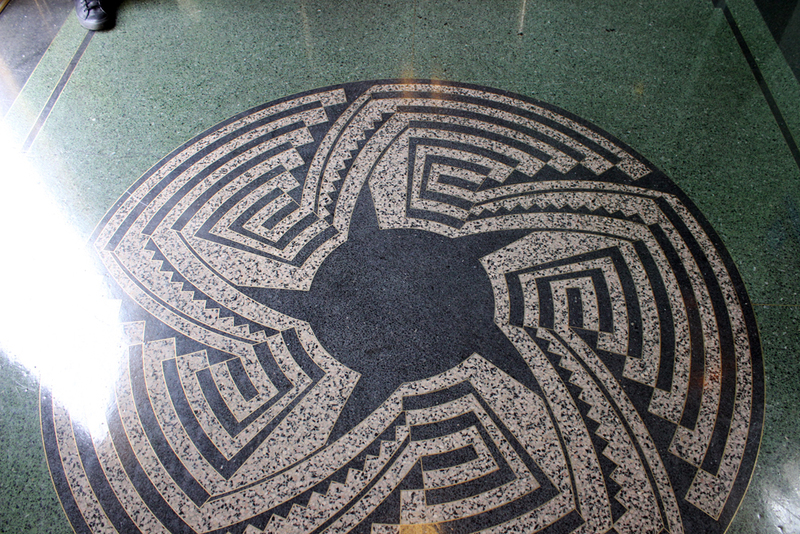 Terrazzo floors! Caught in a moment. 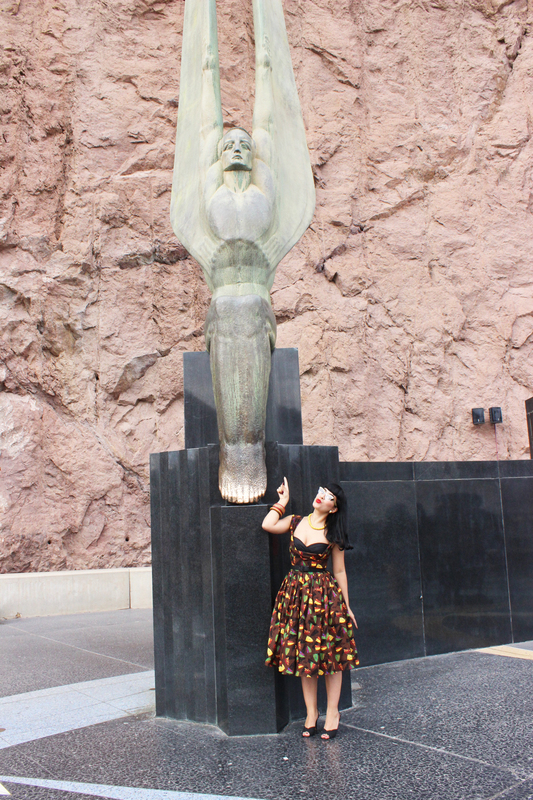 Now striking a pose lol Boulder City! If you are wondering what I am wearing..I wore one of my favorite vintage repro dresses by Bernie Dexter called the Beatrice dress that I recently snagged over at Slapback NYC! Bernie Dexter has incredible dresses and separates so I encourage all of you to visit her online shop. This is my first shelf-bust dress and it fits me like a glove. I love the print so much. It was the first thing that caught my eye when I visited the Slapback shop. If you are in the New York area and want to try them on for yourself, visit my girl Renee at the Slapback shop in Brooklyn. 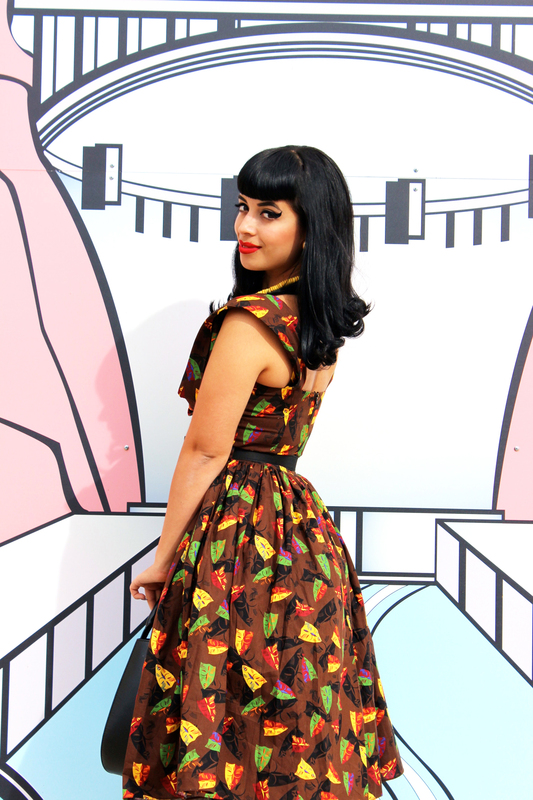 She always has a bunch of great vintage repro apparel from different designers. The print of the dress is a bunch of tiki masks. I am wearing a petticoat underneath for that extra flair and my shoes are vintage. For accessories I kept it simple with vintage jewelry and my black Kate Spade purse. Goat Feathers Emporium! I was so happy here! Look at all the pretty flowers! Even their door is antique! Floor to ceiling antiques and vintage things. I want it all. Might come back for this one when I move! Vintage clowns clowning around. Awesome Kodak Tourist camera which appears to be from the 1960s! Old cartoons! I know many cosmetologists who would love that traveling makeup case! Antique sewing machine! Cute Hershey’s tin! CANDY! Had to take this home with me. It was hypnotizing. Antique spanish jems. 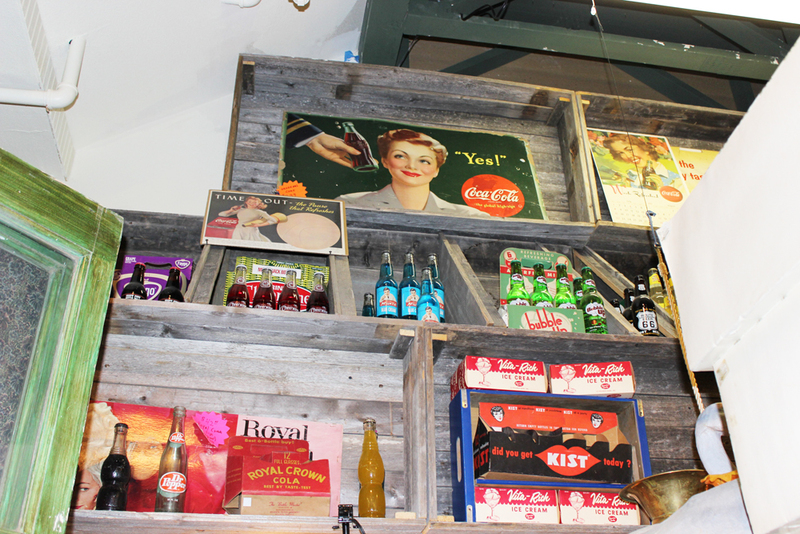 ❤ Vintage sodas and signage! Amazing how much creativity was put into things from the 20s-60s. Just look at that milk carton and coffee box. Some new, many old. Vintage tin things and ice cream boxes. Love this painting! Its new but I’ll still take it! Off to Back in Thyme! Oh you know, just standing next to this slightly vulgar ice cream cone. lol. Bill’s whole set up is wonderful. Here we are! Love this antique western lamp! How adorable is this little petal car?! Antique tin toys <3! Another awesome petal car. Some really old petal cars. I love to rummage. I can spend hours at antique/vintage/thrift stores. Love that slot machine piggy bank! Awesome 1930s vintage hair nets and some bathing beauties. Vintage children’s art supplies. Mr. Hundred Dollar Bill! He was really awesome. Look at these cool photos he gave me. That’s Lucille! love this one too! Bill told us that this scene was filmed in Boulder City on a whim without any permission. As you can see it was shot at a college in the city. So awesome. Thanks to our visit to Back in Thyme, this was my best find of my trip. A vintage Barbie hat box/purse from the 60s! I am so in love with it. My bestie Santiago was in heaven himself with all of these antiques! haha! That cool thing is going to make someone who owns a bar very happy someday! Another cool petal car! Thanks for the tour and amazing shopping experience Bill! Of course on the way out we came across this cool motel sign that I just haddd to take a picture of. So pretty! After a long day of sight-seeing, it was nice to relax with our friends Daniel, Mila, and Riannon. We adore them so much. Lol. Mila is totally photo bombing haha! Big thank you to Riannon, Daniel, and Mila for showing us such great hospitality every time I come to Vegas. 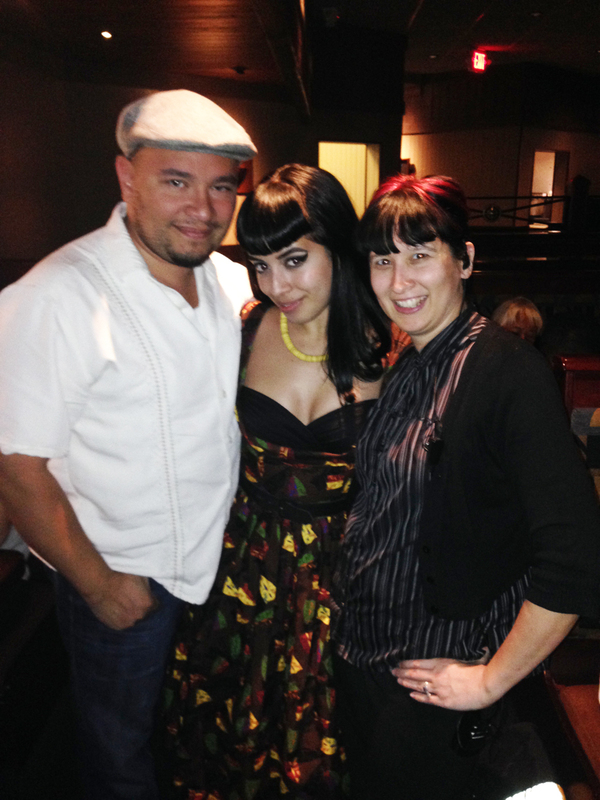 Such a beautiful family I feel fortunate to know. ← Cannery Casino’s Top Famous Pinups of all time! Vegas looks good on you!! That username, though. hahaha I had a good laugh all by my lonesome right now. It’s so crazy to see this side of the U.S. and Las Vegas from your point of view. I grew up here (California) and I take these views for granted! I’ve figured that if you’ve seen one Joshua Tree, 100 miles of empty space, or random antique motel signs, you’ve seen them all! At this point I’m itching to explore everything with new respect and appreciation. Once you get settled in Vegas, I’m sure you’ll several trips over here to California. 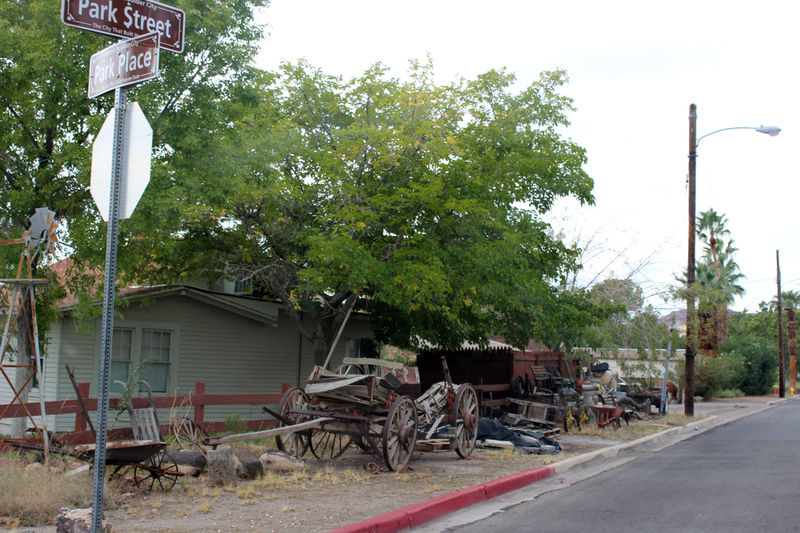 Bakersfield is a mere four hours away from Vegas (a long drive across the desert, and there are so many ANTIQUE STORES throughout that barren land…you’ll go mad! 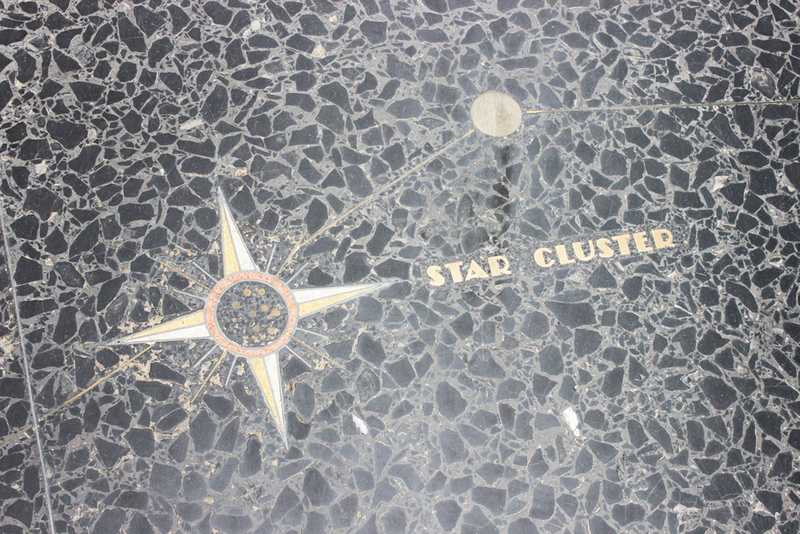 ), and it is littered with unique antique malls and stores that you would have fun sifting through. I’ve not left a comment in ages, but I wanted to let you know that after five plus years I’m still reading every post. I wish you well on your pending move; I admire your stamina and courage! Looks like you had a hell of a great time. Love all the pictures as usual and would have loved to have seen all those great places when I was in Vegas. Another great Post. Keep them coming. Welcome back Chandra. Its nice to see you commenting again. I must say that from all of my duaghter’s followers, you always stood out the most to me because you have always supported her with your feedback. Glad you decided not to give up on her. She needs more people like you to continue to show her that her blog really does mean alot to her fans. I thank everyone of them as well for showing their support too. With ‘Back in Thyme’ painted over the door. Once inside, their heads would spin! Paraded around at the top of the building. Drawers all spilly with things inside. She’d sell a bunch and order more. Surveyed her work and felt proud of herself. I was 43 when I opened my store and started my new life. Like you, I have had to learn so much along the way. You are wise beyond your 27 years and the insight you openly share is right-on.